As i was browsing through my blog, i noticed that i have completed a total of 25 posts (That's a silver jubilee). The 25th post was on a new technology of DNA sequencing. The response was great. What a great way to celebrate silver jubilee. Let me not dwell on the matter, but i noticed that i had posted only one post on "Mycology". So this time i decided to write on Cryptococcus. This blog-post has to do with a paper in "Eukaryotic cell" by Kirsten Nielsen, titled "Titan Cells Confer Protection from Phagocytosis in Cryptococcus neoformans Infections". Cryptococcus commonly known to be a yeast has its telomorphic state belonging to genus Filobasidiella. The fungal spores are usually inhaled as it is present widely in environment. In healthy individuals infection is cleared, or can remain in a latent form for prolonged periods of time. Both ways, the infection is not serious enough or clinically apparent in immuno-competent hosts. However, immuno-compromised individuals are at risk (Source). 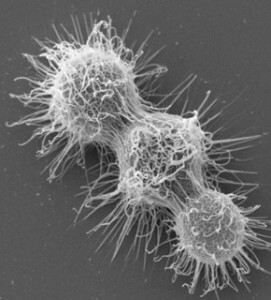 Typically, the spread of C. neoformans is limited to the lung and lymph nodes, but hematogenous dissemination may result in the seeding of other organs (Source). 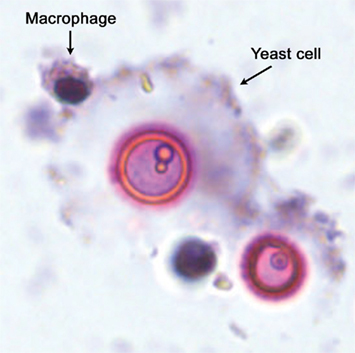 It is a well known fact that the cryptococcus neoformans has affinity to sphingolipids. The increased density of sphingolipid molecules correlates with thickening of the cell wall, hence with its biosynthesis (Source). The CNS has a high density of sphingolipids and hence a natural tendency for the pathogen to reside in CNS. 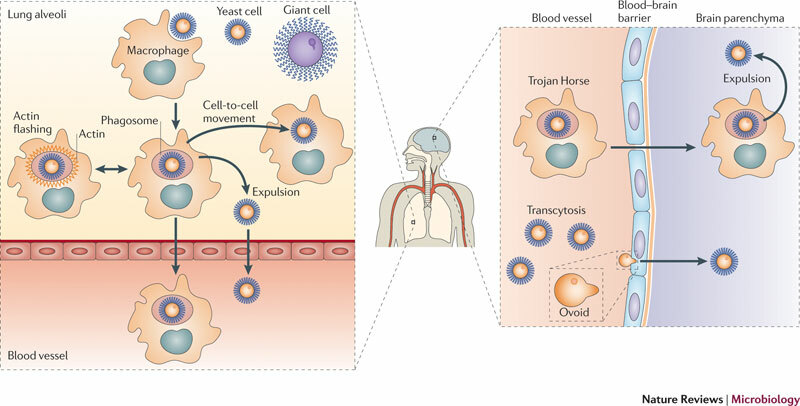 As Dr Nielsen puts it "While most healthy individuals are resistant to Cryptococcus infections, the fungus can cause deadly disease for those with already weak immune systems". 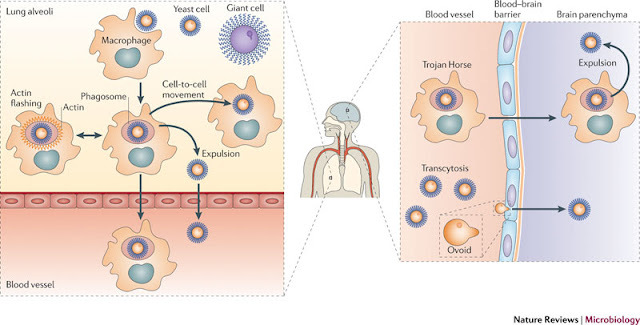 Fig 1: Pathogenesis of Cryptococcus (Source James W. Kronstad etal). 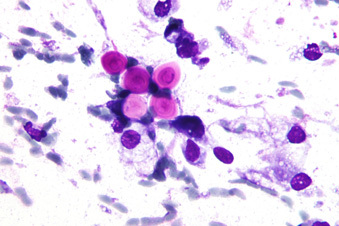 Though C neoformans has been the leader of fungal meningitis, a closely related species C gattii is now gaining importance. Classically, C neoformans was proposed to have 3 important virulence factors (Link). Titan cells are an alternative nomenclature for giant cells formed in experimental infections of mice. This later was found to be important in human infections as well. Studies have shown that, the titan cell are a reproducible phenomenon, but their proportion is highly variable. cAMP signaling pathway is required for cryptococcal giant/titan cell formation. 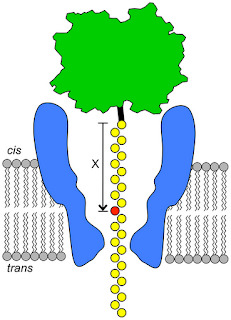 Members involved in the cAMP signaling pathway have been known to affect giant/titan cell formation. This includes Ste3a and Gpr5 (G-protein coupled receptors), transcription factor Rim101. Other proteins involved in cellular enlargement, like G1 cyclins, Rho-GTPases, and GTPases-activating proteins, suggests that titan formation requires the interplay of different pathways in the cell (Source). Photo 2: Interaction between macrophages and cryptococcal giant/titan cells. The summary of paper is that the titan cells were nearly 10-20 times the size of a normal cell, which is way too large for the immune system to get hold of and phagocytose. The point is the fungus beats the defence by sheer size. The more interesting fact is that the titan cell formation also conferred protection from phagocytosis to normal-size cryptococcal cells. It was also mentioned in the paper that the titan cells are crucial for Cryptococcus to survive phagocytosis, but that titan cell size in itself is not sufficient to provide the observed cross-protection of normal-size cryptococcal cells. There seems to be a missing link. Photo 4: "Titan cells" protect the fungus Cryptococcus neoformans during infection. “This tells us that titan cell formation is an important aspect of the interaction between the human/host and the organism that allows Cryptococcus to cause disease,” said Nielsen. “This information will help us find new ways to treat Cryptococcus infections that are very difficult to treat with currently available drugs.” (Source). 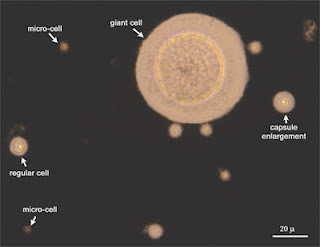 The bottom line is that a few titan/ giant cells formed by Cryptococcus neoformans is a survival strategy for the fungus, that helps in colonizing the pulmonary sites, and promotes the entire population survival. Science is a subject that you never get bored of. And "microbiology", definitely not. And that fuels to me to write. Few of a times, i have written pure microbiology and sometimes, i tried to address some common questions. Occasionally i have strayed away from the main topic, cause i considered that it was worth making a note of and hence an exception. Now, am in a similar situation. This is just fascinating and i have to write about it. Its a new leap in DNA sequencing technology. We are in a age of scientific data explosion. From an era, where we didn't know what is the basic chemistry of life (Just half a century ago), we have leaped to a time where we can construct synthetic life (Oh, the credit goes to Craig venter's team. Read the story). And what made this possible is the ability to read the basic sentence coded in the genome of life (The DNA sequence). DNA Sequencing can be done by various techniques. Sanger’s method, Direct PCR Pyrosequencing, Maxam and Gilbert sequencing, automated fluorescent DNA sequencing etc are some methods that essentially works on similar principles. 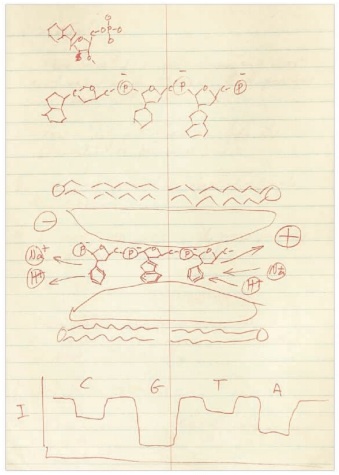 Please refer to my writing posted in notes section of my blog under “Techniques in Molecular Biology” in case you need background information. But we are a crazy race. We are never satisfied. So we see disadvantages with these methods such as the machines are bulky and cost of sequencing is high, time consumption is more for whole genome and etc etc. 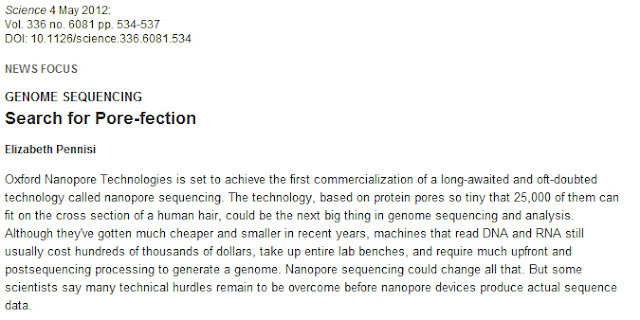 And so the focus is now all on the next generation sequencing gadget with a method referred to as "Nanopore sequencing" or more commonly known as "Pore-fection". The article that caught my attention is shown here below. The idea initially spoken out by David Deamer, teamed with Daniel Branton. Around the time, geneticist George Church independently developed the idea. Church pursued other sequencing projects, but Deamer kept working on the idea. Photo 2: Sketch by David (Source), the original thoughts on Nanopore sequencing. The idea behind this whole technology is just fascinatingly simple. The DNA is made to flow through a protein pore. This alters the ion flow through the channel. This ionic flow produced is different for each nucleotide. By measuring the signals of ionic flow this can tell you the base. Since this involves some pore forming protein, the bulk of machine is reduced at least theoretically. And since the whole thing is a single flow, this can be fast and efficient if fine tuned enough. The first player to be studied as possible protein pore was α-hemolysin, which was studied by John Kasianowicz (he was investigating protein as potential biosensors for toxic heavy metals in solution) produced by S. aureus. 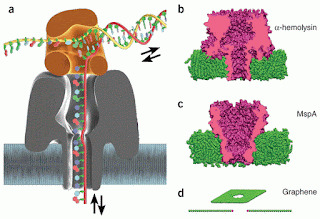 In 1996 PNAS paper by Kasianowicz etal, they showed that electric field can drive single-stranded RNA and DNA molecules through a 2.6-nm diameter ion channel in a lipid bilayer membrane. (Click here for source). So the pore protein was ready. A second problem that needed to be solved was the speed of DNA/RNA moving through the pore. And it was moving fast, way too fast for them to get a well identifiable signal. In 2010, Akeson found the ϕ29 which can push long stretches of DNA, one base at a time, at a steady pace through α-hemolysin that allowed recording of signals. (Link). So, the problem solved? Ah not. They were not able to still get a clear distinct signal, they were not distinctive enough. So they had to search a better pore. The new pore MspA (Mycobacterium smegmatis porin A) was brought into lime limelight by Jens H. Gundlach. (Source). They were able to comment that "MspA had high signal-to-noise ratio and the single nucleotide sensitivity desired for nanopore sequencing devices." And finally with a new pore and a new polymerase, nanopore sequencing finally looks like a great possibility. In a more recently published data in "Nature biotechnology", by M Akenson it was shown that Up to 500 molecules were processed at about 130 molecules per hour through one pore. (Click here for source). I would say thats an incredible improvement. I would like to make a statement here. With more fine tuning, we will one day be able to sequence maybe an entire genome of human, design personalized treatment strategy (Area of pharmacogenomics) or take a sample in clinic put in some chip (just imagining), and say "well these are the organisms sitting in your wound" with a turn around time of less than a day. Not only will it be specific and cost effective, it will be mind blowing accurate. As Elizabeth Pennisi puts it in a podcast interview "Well, the first human genome took about three years to do. Now they can sequence a human genome in about a week. And with these new technologies – depending on how many sets of pores you use – they’re talking about doing it in an hour" and the device will be "little bit bigger than a thumb drive". Before i begin to talk, i need to make a point. Often many people think and ask me how do i get to write so many things. The answer is am not at the top of knowledge. Instead, am at the bottom. When i come across a topic that happened to be interesting enough to me, i try to gather some knowledge about it. And the notes that i make is what is written in blog. I end up with few errors (I must admit it!! ), at times and when i come to know i try to make the correction. Ok, so now that i made the clarification i can go ahead. Right??!! Being a + sense RNA virus, what do you expect the virus to do? Indeed, it just enters the cell, and codes for proteins, makes new genome copies and escapes of the cell. Meanwhile the cell tries to defend itself by producing some RNA interference. By the way did i tell you what's this edition of blog all about? Oh, right time to tell. 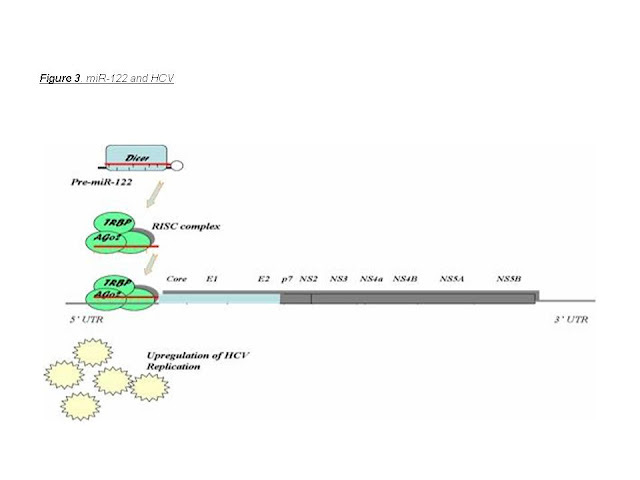 The HCV just used this RNA interference pathway to its best. Puzzling isn't it! This is about a micro RNA 122 seen in abundance in the hepatic cells that aids the replication of the HCV. The entire discussion about this needs to be put into 3 sections- MicroRNA (miRNA), miRNA 122 and how the HCV hijacks the mir122 for survival. RNAi or RNA interference is a normal physiological process used for regulation of RNA in cells. The work initially began from studies in C. elegans, now is a major tool in molecular studies. A minimum of 3 components is involved in RNA interference in higher eukaryotes: Drosha, Dicer, and Argonaute (Ago) gene family members. The current working model flows so. A mi-RNA is processed by drosha and dicer to produce si-RNA. 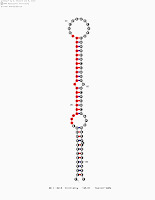 This produces a defined dsRNA containing about 17–23 bp of dsRNA and 3′ 2-nucleotide overhangs. 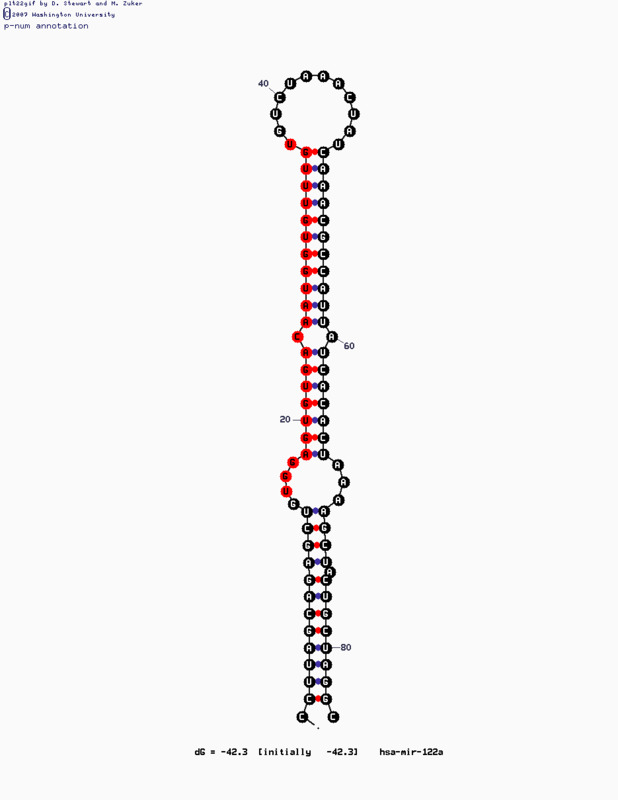 These small RNA is incorporated into RISC (RNA induced silencing complex). 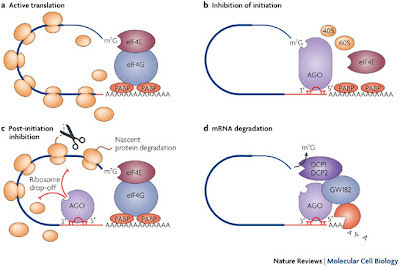 The figure illustrates a model of micro RNA and its processing (Source). 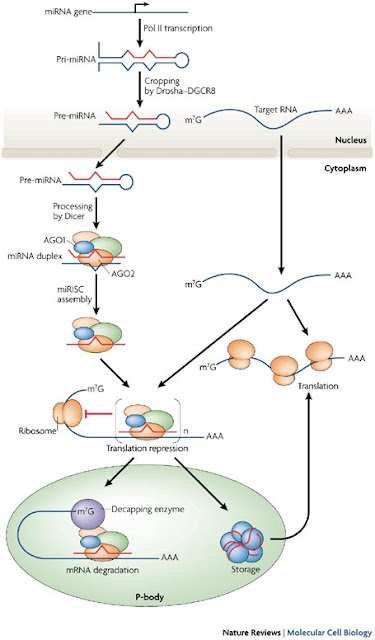 RISC is a large multimeric complex which incorporates the miRNA or the siRNA into itself. 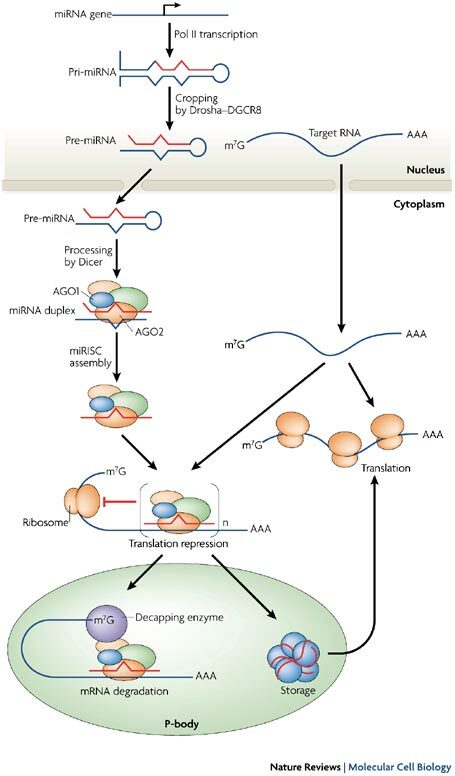 The RNA sequence helps in recognizing the complementary mRNA, mainly through base paring to the 3′-untranslated region of target messenger RNAs (mRNAs). 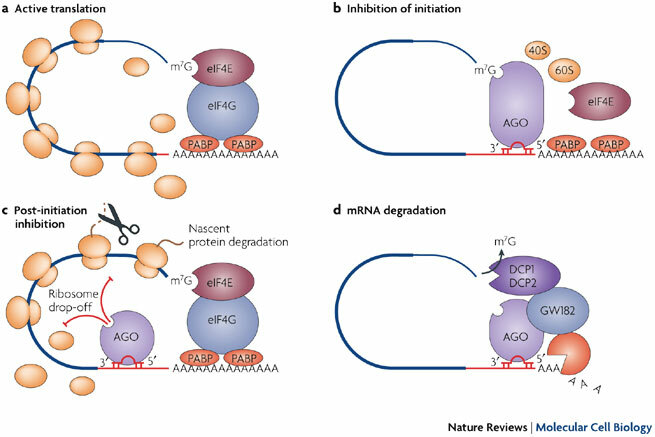 On successful recognition, RNAase comes to play and the targeted RNA is cleaved. miRNA 122 is a highly conserved vertebrate specific RNA species, with high activity in liver. It is being studied in immense detail, owing to its role in the lipid pathways. It is estimated that the miRNA 122 makes up nearly 70% of the hepatic cell miRNA content. The consequence of miR-122 inhibition in normal is lowering of plasma cholesterol (Click here for source). From this its clear that the miRNA 122 is in abundance in the hepatic cell and thus makes sense for HCV which resides in the hepatocytes to use it. The first important idea that, the micro RNA 122 is involved in upholding the cause of HCV was suggested by Jopling CL etal (Link here and here). 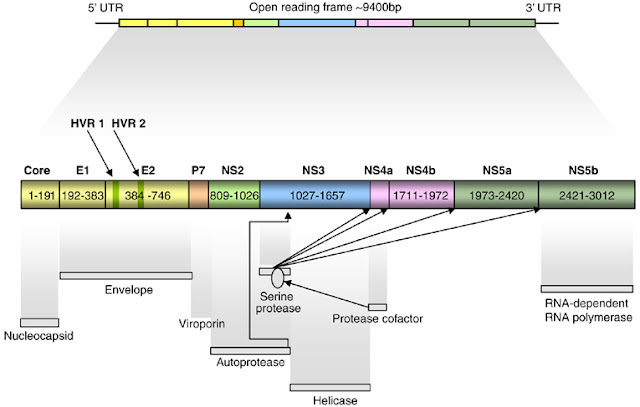 The paper in PNAS by Shimakami T etal, have shown that the miR-122 instead of binding to the HCV 3' UTR sequence as it must be doing, it binds to the 5' UTR and stabilizes the set HCV genome, protecting it against the 5' exonulcease. In a sense, this caps the 5' region (Link). A fantastic discussion on the whole issue is well discussed in TWiV (Episode 180) podcast and i really cannot make a better statement than they already have. In short, my take home message is that miR122 is a potential target of treatment against HCV. 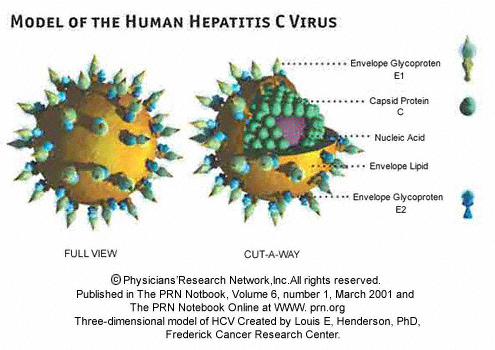 The interaction involves stabilization of HCV at 5' end. 1. Jopling C. RNA Biol. 2012 Feb 1;9(2):137-42. Epub 2012 Feb 1. 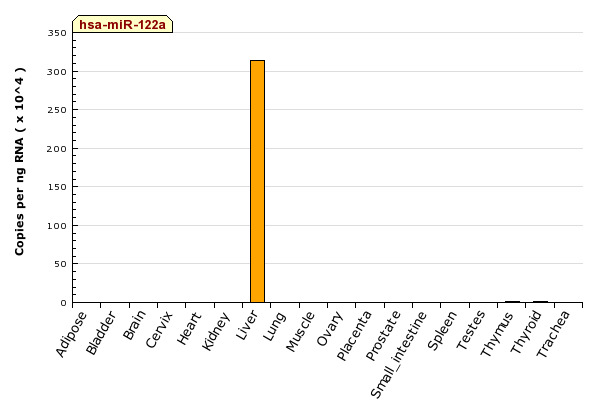 Liver-specific microRNA-122: Biogenesis and function. (Link). Since the inception of this blog i have written about antibiotics, bacteria, viruses and some elementary frequently asked questions in microbiology and more. But, i have candled very little on fungus. 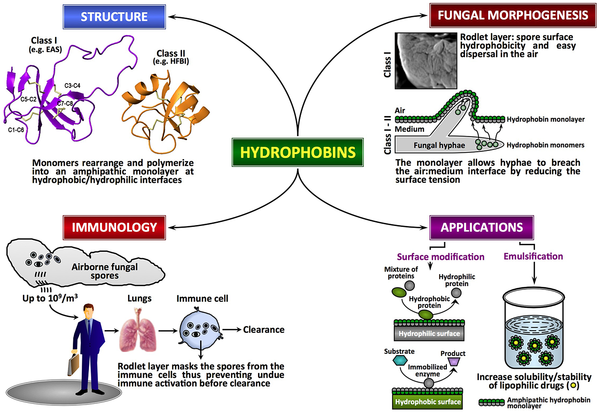 So this time let me blog on a mycology topic- "Hydrophobins". Ah and let me mention, the push to write on this comes from an article published in PloS pathogens titled "Hydrophobins- unique fungal proteins". "Hydrophobins are surface active proteins produced by filamentous fungi". The Hydrophobins are a group (I better call them a family) of proteins secreted by the fungus usually less than 20kDa (with aprox 100 amino acids in it) in size, characterized by high hydrophobic nature and 8 conserved cysteine residues. They are implicated in many functions, one of them being involvement in the formation of aerial structures and in the attachment of hyphae to hydrophobic surfaces. The entire class of hydrophobin is divided into 2 subgroups- Class I and Class II. The Class I hydrophobin aggregates are relatively insoluble, and can be dissociated by reagents such as formic acid or trifluoroacetic acid. The class II in contrast, aggregates are more easily soluble in 60% ethanol and 2% SDS. Why? Because, In class I, there is a considerable variation in the inter-Cys-spacing; these hydrophobins assemble into highly insoluble polymeric monolayers composed of fibrillar structures known as rodlets and difficult to shake of. On the other hand the inter-Cys spacing are more conserved in class II. The hydrophobins are known to be one of the strongest of the surfactants known with some strange biophysical properties. The atomic structure HFBII was determined by Johanna Hakanpaa etal. The structure uncovers that the protein is a single domain structure with one α-helix and four anti-parallel β-strands that completely envelop two disulfide bridges. It is calculated that HFBII is able to reduce the surface tension of water from 72 mJ/m2 to 28 mJ/m2 at a concentration of 20 μg/ml (That's incredible; for details on surface tension click here). In case of class I such as EAS, the structure is monomeric but mostly unstructured in solution, except for a small region of anti-parallel beta sheet that is probably stabilized by four intramolecular disulfide bonds (Link). The importance of these molecules in the field of medicine, is just emerging. The Hydrophobins are thought to be an important factor in virulence. This is at least an hypothesis in case of A. fumigatus (Source), Beauveria bassiana (Source) and possibly many more. In the article the authors state that, therapeutic use would include generating a hydrophobin- based nanoparticle with embedded therapeutic proteins and molecules that can be released in a well defined control fashion, without bumping an immune response . (The original sentence reads "From a therapeutic point of view, the degradation-resistance and immunologically inert properties of hydrophobins could be used to generate hydrophobin- based nanoparticles with embedded therapeutic proteins and molecules that have to be slowly released within the host or transported to a specific body location without being recognized by the host immune system. ".